The Branchaud family of Rutland assists Vermont Fish & Wildlife with trophy trout stocking on East Creek in Rutland late last month. The Department’s annual fish stocking work is in full gear across the state and will result in over 750,000 fish stocked into Vermont waters in 2016. Vermont Fish & Wildlife’s annual fish stocking work is underway and the Department plans to stock over 750,000 fish into Vermont waters in the coming weeks. Exactly 768,500 trout and salmon will be stocked, including nearly 300,000 that will be catchable-sized fish, as well as almost 20,000 trophy trout. Vermont has a wealth of rivers, lakes and ponds that support naturally reproducing trout populations, including everything from small upland streams and beaver ponds that hold abundant wild brook trout, to bigger rivers which host wild brown and rainbow trout, and large cold water lakes with wild lake trout. However, not all waters are able to support wild trout populations. 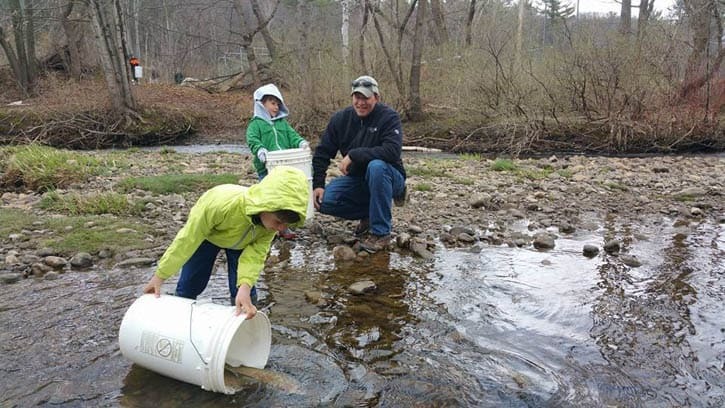 One popular component of the stocking program is the trophy trout initiative, which was fully restored in 2015 with the reestablishment of the trophy brook trout program. In addition to the trophy trout, over 271,000 yearling landlocked Atlantic salmon, brook, brown, rainbow and lake trout, as well as steelhead rainbow trout, will be stocked into Vermont streams, lakes and ponds other than Lake Champlain. Lake Champlain is scheduled to be stocked with over 413,000 landlocked Atlantic salmon, steelhead rainbow trout, brown trout and lake trout – including fry and fingerlings. For a complete 2016 stocking schedule, to purchase a fishing license or for more information on fishing in Vermont, visit www.vtfishandwildlife.com.